The Elements gel cushion from Comfort Company has a QuadraGel pack along with a single layer of foam for comfort and support. 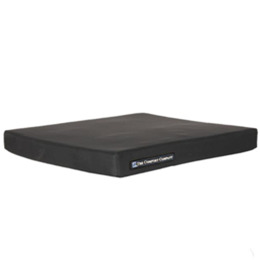 Designed with custom comfort in mind, this cushion can accommodate multiple user sizes. With several sizes to choose from, the QuadraGel pack will provide a sure fit. Four gel compartments are smartly designed to prevent gel displacement and enhance the support and longevity of the cushion. The foam layer contours to your body and reduces high pressure areas while regulating body temperature. The Elements cushion has a non-skid bottom and has a hook and loop connection to the chair. The Comfort-Tek cover has a fluid proof exterior with a leather-like feel that is easy to clean.